Bluffing is an important element of poker. As a verb, bluff means ‘to deceive someone by acting as if you are confident.’ A bluff is the act of bluffing or, in US English, a person who bluffs (in UK English, such a person would be called a bluffer). As an adjective, bluff is used to refer to a direct and honest way of speaking. The businessman said he would walk away from the negotiations with nothing if he didn't get exactly what he wanted, but everyone knew he was bluffing. Her new boyfriend is just a bluff! I don't believe a thing he says. Bruno pretends to know it all but I think his behavior is just a bluff. Mr. Mendes has a bluff way of addressing students and they all like him. Being able to bluff is an important skill in poker, where winning is not so much about the cards you have but your ability to convince your opponents that you can beat them. Bluff, as a verb meaning ‘to deceive someone by acting confident,’ has an uncertain origin. Some linguists believe it dates back to the mid- to late 17th century, and originally meant ‘to blindfold, hoodwink or fool.’ In this theory, bluff comes either from the Middle Dutch verb bluffen (‘to make something swell,’ and figuratively, ‘to bluff’ or ‘to play a trick at cards’) or from the Low German verb bluffen (to bluster or frighten). Other linguists think this older sense of bluff is not directly connected to the modern sense, which appeared in US English in the mid-19th century, and probably came from the Dutch verb bluffen, meaning ‘to brag or boast‘ (this Dutch verb is related to the Middle Dutch and Low German sources in the other theory. 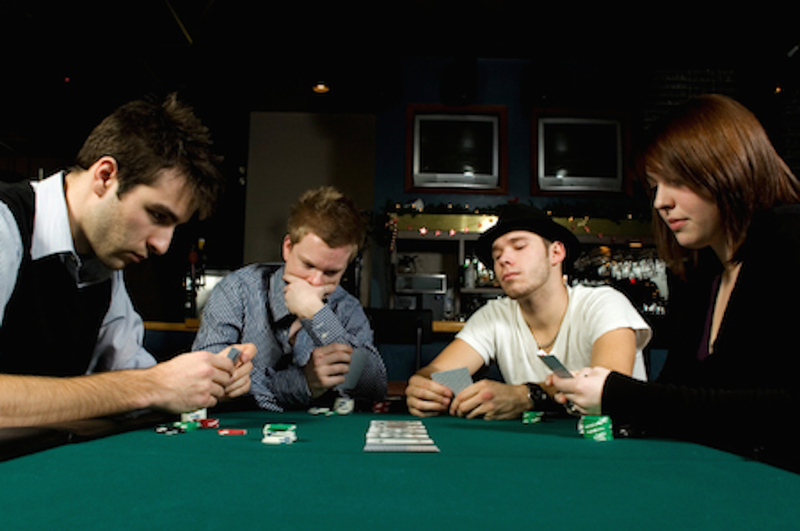 The modern sense of bluff was originally used in poker, but its use expanded to general language within a decade. As a noun, bluff, originally used as an alternate name for the game of poker, dates back to the early 19th century, and comes from the same source as the verb. The sense ‘an act of bluffing’ was first used in the mid-19th century. Bluff, as an adjective meaning ‘with a broad, flat front,’ dates back to the early 17th century. It has been used figuratively, to describe a person’s gruff, direct manner, since it came into English from the Dutch blaf (flat or broad), used commonly by sailors, and is unrelated to the prior senses. The noun, meaning ‘a broad, vertical cliff’ or ‘a high bank,’ dates back to the late 17th century, and comes from the adjective.